Elvis Costello and the Imposters, with New Orleans legend Allen Toussaint, will be among the headliners at the Jazz Aspen Snowmass June Festival at Aspen’s Rio Grande Park. The festival bill, announced today, also features Costello’s wife and JAS regular Diana Krall and her quartet. The festival, presented by new title sponsor Calamos Investments, returns to its tent at the park on June 22-25. The festival opens Thursday, June 22 with a special program, “New Voices,” headlined by the Jamie Cullum Trio, led by the English-born vocalist/pianist whose debut album, “Twentysomething,” sold 2 million copies. Opening for him will be Lizz Wright, an emerging star who presents a style that fuses jazz, soul, folk, blues and gospel, according to JAS. Her latest album, “Dreaming Wide Awake,” brings together songs associated with Neil Young, Fats Waller, the Beatles, Madonna and Herb Alpert. Friday, June 23 brings one of the few American dates of the year for multiple Grammy winner Diana Krall, the jazz singer/pianist who has been a frequent JAS performer. (There will be no opening act on Friday). Her most recent triumph is her Christmas Songs album, which was released last year to critical acclaim and was the top-selling holiday album of 2005. Since her recording debut in 1993, Krall has recorded nine albums distinctly rooted in the jazz piano/vocal tradition that have also enjoyed crossover success. Before Christmas Songs, her 2004 album, “The Girl in the Other Room,” was her first release to focus on her own songwriting, and includes six tunes co-written with her husband, Costello. Costello will take the stage Saturday night with his band, the Imposters, as part of a tour with New Orleans’ Toussaint that celebrates the music and heritage of the Crescent City. Costello burst onto the American scene in 1977 as a so-called New Wave rocker with tunes like “Allison” and “Red Shoes.” His latest album, “My Flame Burns Blue,” features old and new songs in a big-band orchestra setting, recorded live at the North Sea Jazz Festival. His previous album, “Piano Jazz,” captured his session with the legendary jazz pianist Marian McPartland. His next release, “The River in Reverse,” due out in May, is Costello’s response to Hurricane Katrina and may be the first album recorded in New Orleans since the devastation. Opening for Costello will be Delbert McClinton, whose career has run from coaching John Lennon on the subtleties of harmonica playing in 1962 to writing songs for greats like Emmylou Harris, to his duet with Bonnie Raitt, “Good Man, Good Woman,” which won a Grammy in 1991. He fuses blues, rhythm and blues, and country honky-tonk. Opening on Sunday will be funk master/alto saxophonist Maceo Parker. Sunday’s closing headline artist has yet to be announced. Tickets go on sale to JAS members on Monday, March 20, by phone at (866) 527-8499. Tickets go on sale to the public on Monday, March 27 by walk-in at the Wheeler Opera House, online at jazzaspen.org and by telephone at (866) 527-8499. Perhaps the most compelling part of The River in Reverse, the brilliant collaboration between Elvis Costello and legendary New Orleans producer-songwriter Allen Toussaint, is the immediacy that crackles through the music. A mix of Toussaint classics and new compositions, the album was written and recorded as Hurricane Katrina was still wreaking devastation on the Gulf Coast, and it was wrapped up with sessions in New Orleans days after the city reopened to outsiders. 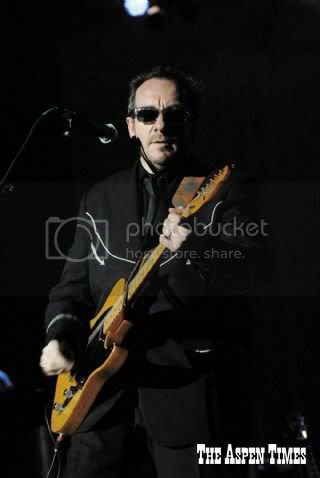 Costello performed at Seattle's Bumbershoot festival in early September 2005 as Katrina images filled every TV screen in the nation. He sang Toussaint's Freedom for the Stallion. "It's pretty impossible to go onstage when you know everyone's watching something and there's a communal feeling about it and not reflect it in some way. I couldn't think of any song of my own that had any better meaning," particularly since he and Toussaint had both played the New Orleans Jazzfest just months earlier, he says. After participating in several benefits for Katrina, Costello says: "I knew by that point that Allen had made it to New York. I asked if someone could find out where he was at and ask if he might have any interest in renewing our acquaintance musically." They'd collaborated on a couple of pieces of music in the '80s. Costello found Toussaint playing a set at Joe's Pub and sat in on a couple of songs. "When he approached me, I pondered for every bit of about two seconds and was very glad to say 'yes.' We got right to work on doing things," Toussaint says. "When Allen and I started writing, New Orleans was under martial law. You couldn't enter the city," Costello says. "You couldn't even get information about when you could enter the city." Toussaint's band members had been displaced as well, and Los Angeles ended up being the city with most of the musicians, so sessions started there. "During the process of writing, word came from the city that you could actually go there on other than federal or Katrina-related business. So we were able to do the second week of recording in New Orleans," Costello says. While initially planning to just cover Toussaint classics that seemed fitting, such as Who's Gonna Help Brother Get Further? and Tears, Tears and More Tears, "it became apparent that we were going to create some new pieces," Costello says. Those songs make up the sometimes-angry heart of the album, along with Costello's title track. Broken Promise Land particularly melds the two artist's styles, with Toussaint's elegant piano lines counterpunched by stinging Costello guitar. "Broken Promise Land instrumentally ended up being Allen's piano and my guitar, that tremolo thing that I've used as a signature sound, I suppose, inasmuch as I have anything like that in my fairly limited palate of guitar-playing ideas," Costello says. "Elvis has such a heart for the music it translates in every facet, be it lyrical content, melodic lines, chord structures. It just goes to show how dearly the music is in Elvis' heart," Toussaint says of the collaboration. "I remember being a bit too deferential the first time we sat down at the piano," Costello says. "We couldn't seem to get really flowing with ideas. Tentative is not the right word - just too respectful of one another's point of view." Costello liked Toussaint's version of the late Professor Longhair's Tipitina transposed to a minor key. The two turned it into Ascension Day, a song that starts dark but ends with hope. "It began with this very bleak image, described to me by a friend in the city, to the hopeful last chord. It could mention things that happened, but it had to go somewhere hopeful," Costello says. Joy is apparent in other songs. International Echo is a raucous tribute to music in general. "(That song) was the one that I got a kick out of," says Costello. "The music was all there - Allen came in and played this piece down and it was just telling me a story. I went home that night and wrote the whole lyric. "And it had to be about music, and I've never written a song about music before. It had to be about what music does for you, how it turns you upside down. It is a comedic song." Others are more pointed and political. Costello is one of the artists who have been criticized for making political statements in songs. Politicians and TV talking heads say artists are "naÃ¯ve and abuse the privilege of the stage to make naÃ¯ve announcements," Costello says. "Actually it's the politicians who make crass simplifications of complex matters in order that they don't leave office in disgrace or handcuffs. "We're not running for office. We're trying to be humans and feel something and hopefully offer something in a song, whether it gives consolation, whether it gives voice to some anger or disquiet someone has or a purely personal view." The title track of The River in Reverse focuses not just on Katrina but on the nation as a whole, Costello says. "I believe we are surrendering liberty to this climate of fear that is being cynically promoted by people in power. That song is not exclusively about New Orleans. It's emblematic of the way we're treating one another." â€¢ Cost: Costello tickets range from $50 to $90; multiday passes are available. ASPEN - Early in his career, in his days as an angry, English punk, Elvis Costello seemed to reserve his strongest venom for music journalists. The mutual disrespect between Costello and the press came to a head in the early spring of 1979, in New York, when Costello was pushed into a press conference to explain away some rude comments he had made about Ray Charles, James Brown and other gods of American music to rocker Stephen Stills. Costello, 24, and already at odds with the media and under the spotlight for his remarks, instead of apologizing, turned on the press and let loose with the sort of rage evident in his music at the time. "The press were looking for something to crucify me with and I fed myself to the lions," Costello later said, as reported in Rolling Stone. Some years later, Costello would provide another perfect means for the press to vilify him. This time, it was artistic. In the early '90s, Costello, who had shown experimental tendencies from the beginning, started coming fully unmoored from the sneering brand of New Wave/punk that had established his name. The straying started with 1993's "The Juliet Letters," a cycle inspired by "Romeo & Juliet," recorded with the classical group, the Brodsky Quartet. Any rock musician can expect a torrent of criticism when venturing into such serious waters, and Costello was probably bracing for more than his share. Instead, he earned mostly praise: Spin ranked "The Juliet Letters" with Costello's best; Newsweek called him "a songwriter beyond genre." Costello probably didn't need such positive reinforcement to proceed down the non-pop music path. But showing the contrarian, devil-may-care spirit that marked his early albums, Costello boldly claimed a broader terrain than any musician who comes to mind. Perhaps inspired by his father, a big-band singer who had to absorb a variety of styles, Costello tackled it all. "Kojak Variety" covered Bob Dylan, the Supremes and the Great American Songbook. "Painted From Memory" was a duets album with Burt Bacharach. On "For the Stars," a collaboration with Swedish mezzo-soprano Anne Sofie von Otter, and "North," Costello emerged as an honest jazz balladeer. Not all reviewers loved all the work, though each album drew a good amount of critical applause. But Costello was at least taken seriously in his efforts. In recent years, Costello has returned now and then to his roots, most successfully on 2002's "When I Was Cruel." His most notable work, however, has come from outside the pop realm, and sometimes way outside. "Il Sogno," a 2004 ballet score after "A Midsummer Night's Dream," was recorded by the London Symphony Orchestra and conductor Michael Tilson Thomas, and earned respect in the classical world. That same year, he co-wrote much of the material on "The Girl in the Other Room," an exquisite jazz recording by Mrs. Elvis Costello, Grammy-winning singer-pianist Diana Krall. Last year's "The Delivery Man" was a brilliant take on alt-country, featuring guest singers Emmylou Harris and Lucinda Williams. Topping it all was last year's "My Flame Burns Blue," a live recording of Costello with the Metropole Orkest that ingeniously reimagines a jazz orchestra as an avant-rock instrument. Fans of the "old" Elvis should get a kick out of radically reworked versions of "Watching the Detectives" and "Clubland." Costello's latest, "The River in Reverse," finds him wandering again, this time to the damaged music capital of New Orleans. He has stretched in this direction before; 1989's "Spike" was recorded partly there, and featured the city's Dirty Dozen Brass Band. Costello has also worked with Rebirth Brass Band. "The River in Reverse," released earlier this month, reteams Costello with New Orleans' Allen Toussaint, who had added a memorable piano part to "Spike." 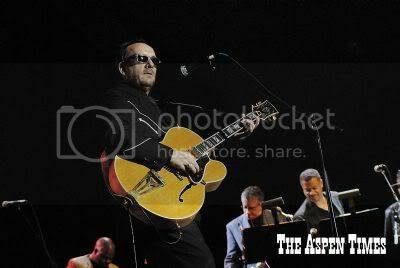 The album - which represents another new twist, Costello as the socially conscious artist - will be the focus of the Jazz Aspen June Festival concert, which features Costello's band, the Imposters, and Toussaint as a special guest. 1. (What's So Funny About) Peace, Love And Understanding? by beautiful mountains. Oh well. Friday's headline), neither of them joined each other on stage. Trey Anastasio made a sharp turn on last year's "Shine," his first solo album since the 2004 breakup of Phish, the band he'd led for most of two decades. "Shine" was a tight, pop-rock production, oriented toward songs and lyrical statements, prompting the question: Would Anastasio's Jazz Aspen Snowmass debut be a jam-free event? Early on in Anastasio's Sunday night set, the closer for Jazz Aspen's June Festival, it appeared the show might be short on the lengthy guitar excursions Anastasio became known for in Phish. Devoting plenty of attention to the "Shine" material, the first half of the show was relatively tame, with only flashes of exploration in "Sand," from the Phish catalog, and "Night Speaks to a Woman," from Anastasio's earlier solo debut. But Anastasio is not the sort to allow the guitar solo to be removed from his repertoire, and certainly he isn't about to be the one doing the removing. The last hour of his show, spanning just three songs, showed that Anastasio has not gone down the singer-songwriter or pop star route. The final sequence was marked by fire-breathing guitar, and not of the sort that has given jam bands the reputation for languid, unfocused soloing. On a new song (perhaps titled "Mud City," as it is called on the website phantasytour.com), and a pair of encores - "Gotta Jibboo" and "First Tube," both from Phish's 2000 album, "Farmhouse" - Anastasio let loose his rock-guitar god, using bassist Tony Weber as his sparring partner. The rapturous audience response tickled the heads of Jazz Aspen, who had previously limited such rock acts to its outdoor Labor Day Festival.